Monero (XMR) – reaches a value of over $300 this weekend, while news of mining advancements make noise in the mainstream. US online news outlet, Salon, now offers it’s readers who choose to use an ad-blocker on their server an alternative to continue to receive free media content – mining cryptocurrencies! The award-winning online news website will be using these user’s unused computer power to mine Monero – a favorite amongst crypto enthusiasts for its anonymity. The influence that the crypto community gives to the mainstream community continues to show everyday as news like this continues to surface. However, the coin has also been being mined on users phones and computer devices without them even knowing. 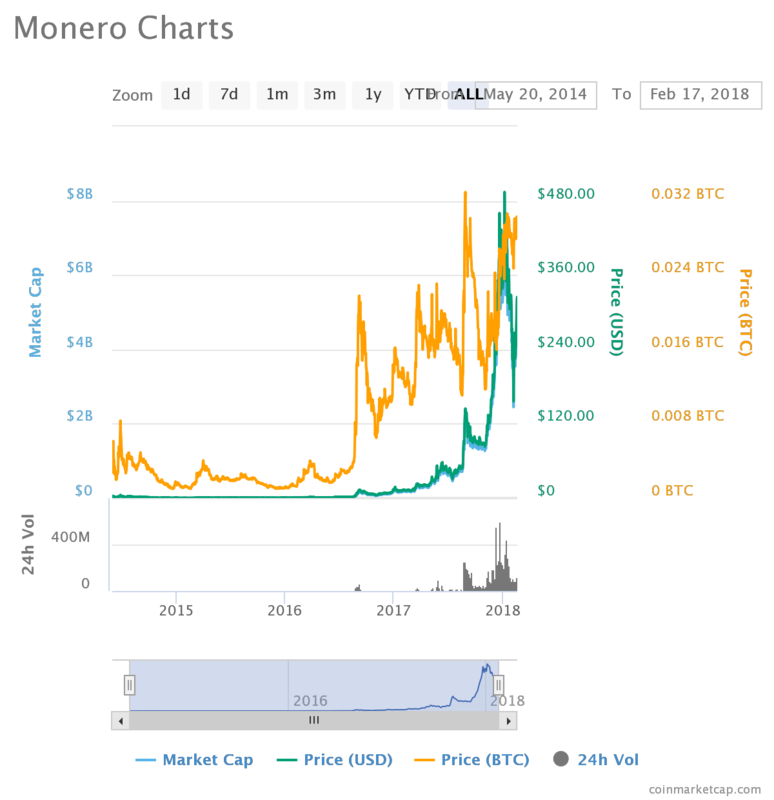 Monero has seen a good week with a rise in price over %40 and most – but the mining tactics leave investors nervous. A Dark-web favorite, XMR is already setting out to revolutionize the global monetary system around the world. At $230 dollars last week, the coins future remained uncertain – as always is the case with the crypto market in this infancy stage. However, over the weekend the coin has increased well above $300 per coin with a market cap of over $5 billion. Monero (XMR) is a proof-of-work (PoW) coin that uses the CryptoNight hashing algorithm. Monero uses a Ring Signature system to protect your privacy, allowing users to make untraceable transactions. Monero has made headlines recently – not for its price – for the controversial ways it has been mined. Security software company Malwarebytes discovered a malware that was being used to redirect user’s to websites that were mining the Monero currency. Criminals are unleashing this malicious software onto user’s phones in order to use the devices processing power to run calculations. Similar to what Salon is doing, only Salon is legally asking for the user’s permission, while these hackers are doing this completely anonymously. Now this isn’t necessarily a bad thing for people looking to invest in the cryptocurrency. It is key to note that of all altcoins, Monero is most popular among dark web users, hackers, and criminals simply because it has the most robust anonymity features. Ad-blocking users who go on Salon’s site will be given two options when logging on to look at a article: Turn on your ads or let us use your devices extra power to mine cryptocurrency. Just like any website, in order for you to receive your free dose of news coverage and trending stories, the site needs to gain its revenue from advertisements. But what if there was another way? “Think of it like borrowing your calculator for a few minutes to figure out the answer to math problems, then giving it back when you leave the site,” Salon told its users. This is a very innovative way for companies to make money aside from ad revenue. With no wire transfer fees and no risk of fraudulent chargebacks, Monero holds strong as a coin with no higher authority. This means no one government or institutions can shut them down. Monero is still maturing as a currency and anything can happen within the next year. Because it can be mined on most devices, it is no wonder that hackers were looking for loopholes in the system. “Within hours of identifying the problem, the compromised script was disabled from the uscourts.gov site,” David Sellers, a spokesman for the Administrative Office of the U.S. Courts. Time and time again we see the crypto community’s influence in the mainstream. Salon is dabbling in the art that gave us the half a trillion dollar market cap we have today: the art of innovation. By incorporating these tactics things will continue to look up for us. We can all agree that we would rather have certified companies like Salon mining coins on our devices rather than we would anonymous hackers from the dark web.